A single-purpose addon that allows for resource transfer between two disconnected vessels using an EVA-attachable resource transfer pipe. 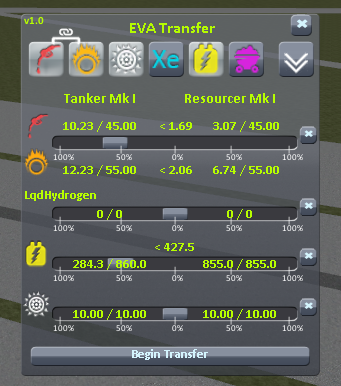 It uses the stock fuel line part and texture (and supports Ven's stock part revamp), and can be found in the Advanced Fuel Systems node, or the Logistics node if using the Community Tech Tree. How is this different from KAS/KIS? This adds only a single feature and lacks much of what is possible with KAS and/or KIS. The resource transfer pipe does not dock the two vessels together, it is a purely cosmetic connection. All resource transfer is handled internally by thy EVA Transfer code; no manual transfer between individual fuel tanks is possible. 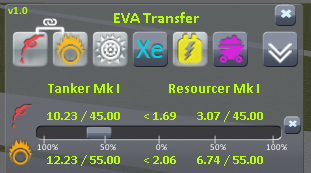 The EVA Transfer pipe start point must be attached to a vessel in the editor, there is no built-in option to attach the pipe itself on EVA, only to connect an already attached pipe to a second vessel. KIS attachment is supported while on EVA. Are there options for which resources can be transferred, how long the pipe can be, etc...? Maximum pipe length, available slack for a connected pipe, and transfer speed can be adjusted. Resource container fill mode can be specified; smallest to largest, the reverse, or no order are the options. The maximum number of resources that can be simultaneously transferred can be specified. 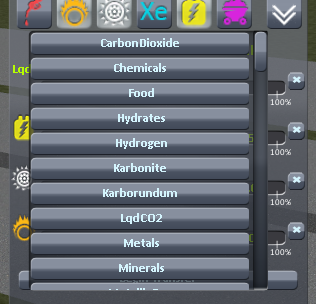 The option to specify a Kerbal Trait to connect the transfer line and a minimum level are available. The Oxidizer To Liquid Fuel Ratio for linked mode can be specified. Tooltips for the window can be activated. Something has gone wrong; where can I get help? If you run into errors, transfer lines not connecting, resource transfer not working, etc... report problems either to the GitHub Issues section or the KSP Forum Thread. Thanks for downloading EVA Transfer!